88 year old Charles Fosterling was cleaning out some of his things. Maybe his wife passed away, or maybe he was getting ready to move into a retirement center or assisted living. Maybe, he was just reminiscing. He sorted through papers and old photos, and stumbled upon one of the house his parents built in 1930, when he was just a toddler. “I wonder if it is still standing,” he mused. “I would like to give this photo to whoever owns this house now,” he told his daughter. She agreed to entertain his idea, and they set off to see what they could see. The dogs started barking out at the street, and begging to go into the house. Harvey’s tail wagged the way it does when he sees someone he wants to meet. Irritated with the pair of them, I let them in and followed them. Sure enough, there was a blue sedan parked out front, the passenger wheels on our little strip of greenway. A tall blond woman was walking up and down the street, holding a piece of paper in her hand, and staring at the house. I went back out the back and met her by the driveway. Could I help her? I wondered if she was lost. I spent the next five minutes or so, sitting on the lawn beside the blue car, talking to Charles. His parents purchased the property from Mr. Charman, he said. They had to burn the scotch broom off the land, and they owned quite a large piece. What they owned then, is occupied by 8 homes now. They built the house and sided it with asbestos siding, which was popular in the 1930’s, and was inexpensive. The land around was all forest, and Charman Street ended there by the house, continuing on as only a dirt track through the woods. This house was the only one up here at the time, according to his memory (the photo seems to show a house in the hack, perhaps on the next street over, as the Fosterlings owned everything over to that street. There was a maple tree out front. I tried to take my photo from the same angle: the living room has an addition, otherwise, the house is still a basic Cape Cod Bungalow. The front door is in the same place, but the stairs turn to the side. The asbestos shakes are gone, replaced with wide siding planks. Charles slept in the living room, and his parents had the back bedroom, one of two bedrooms. The second bedroom was up the stairs, and they were narrow, steep stairs. At some point in remodel, the stairs were taken out and resdesigned to code, creating a “Harry Potter” closet where the old stair case was. There’s a mended spot in the softwood floor under neath my desk in the studio: that is where the chimney came through. The fireplace or wood stove was in the center of the house. Charles spent wonderful years here, exploring the woods and roaming the fields. He was happy to see the house is still standing, and to know that the people who live here now love this house. He doesn’t get around very well anymore. I would have invited him in, but I couldn’t handle the two big dogs and he wasn’t up to trying to walk to the door. He told me that his birthday is April 9, and he was born in 1928. He’ll be 89 next Sunday. After they left, I scribbled down some notes, trying to remember the story. Charles lived here during a time when many homes sat empty due to the Great Depression. I know the next owner was Barney Schultz, and Barney made sausages in a building out back. Barney died in 2000. When we first moved in, one of Barney’s sons dropped by and told us that much. I believe Barney built the addition to the living room and the garage. The house was then owned by a young couple who did some major remodeling, including the kitchen, windows, bathroom, laundry, and electric. They removed the chimney and altered the stairs, and opened the loft. We purchased the house from them when they faced some life changes and had to move. It’s a wonderful old house, a peaceful old house, a house with a lot of fond memories of the people who have lived in it. The rhododendrons out front were planted by Barney, as were the multitudes of peonies. Lots were sold off over the decades, Charman Street pushed through, and Mr. Charman passed into the local history books. Only my neighbor to the north remembers Barney now. She’ll be 89 this year as well. She bought her land from Barney. This house has seen so much, and it’s beginning to give me its secrets. Imagine that! I set this blog up to record our wilderness adventures, then I haven’t been camping since last July. I think I’ve been out in the woods once in that time period and not at all in the high desert. I’ve felt like my world was slowly closing in on me, suffocating all the life out of me. With the 4th of July rapidly approaching and all the noise associated with it, we thought we’d best be out of town with Murphy. He isn’t afraid of firecrackers, thunder or loud noises. He even sleeps through thunder and lightning. But what he is not immune to is the other dogs barking at the firecrackers. He rages from one end of the yard (or house) and back again, barking loudly and furiously at all those other frightened dogs. We really did not want to put up with that and I really needed to get out of town myself. Our destination was a place we’ve visited before: the first time when Arwen was just a year old and still riding in the fancy REI baby back pack. That was the year I dubbed it “It’s Just A Quarter Mile From the Road Honey Lake”: Don assured me this was a short hike into a lake he found on a USGS map. We were new to the Mt Hood National Forest, fresh from the eastern side of Oregon and high desert. So we parked at the base of the hill and loaded up: one of us carried a daypack with 2 beers (one for each of us), some snacks, and miscellaneous survival stuff we always carry. The other one carried our marshmallow baby (so called because she didn’t help you carry her: she marshmallowed into the pack and became dead weight). The dog we had then was a mutt named Rosie, and Rosie took the lead. The hike proved steeper than anticipated. When we reached a lake, it was a glorified newt hatchery – and on the wrong ridge. Somehow, we’d ended up to the south of where the lake we sought should have been. I was tired. We were hot. Surely this would be over soon. We drank our beer and put our empties back into our pack, hefted the baby and headed out on the sidehill. After clamboring over deadfall, rocks, and a small stream, we found another lake: a marshy little number that was decidedly further up the hill than we thought it should have been. No more beer left, so we drank some of our water. 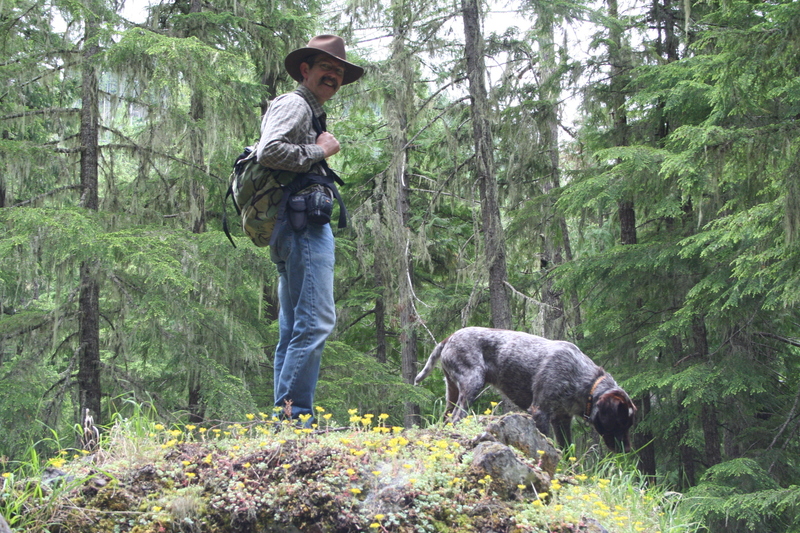 Then we headed out over even more deadfall, steep gullies, and another burbling little stream forded by more deadfall. Finally, we began a descent and I thought our ordeal would soon be over. We came out on a road. A road on top of the ridge. We still had a long way to descend back to our car. Don decided we should follow the newest little stream back down, assuming it didn’t suddenly descend in waterfalls over granite. We stumbled through a maze of rhododendrons. Don tends to forget I am behind him, and lets go of the branches right as my face is level with their natural habitat. The dog was running circles around our feet, but the rhodies were so thick, I couldn’t see my feet. They grabbed my feet, tripped me, pushed me back and slapped me in the face. I began a life-long hate relationship with wild rhododendrons. To heck with Big Foot: the Pacific Rhododendron is out to kill people. And there it was: the lake. The Lake. The one that was just a quarter mile from the car. Four hours, many scratches and bruises later, just a few hundred feet from a road ON TOP OF THE RIDGE, and full of shiny beer cans. BEER CANS?! What idiot 200-pound man carried his full beer in and then couldn’t pick up the empties to haul back out? This 110# woman can (I was 110# then – I am not that now)! Another two hours later, we were back beside our car pulling ticks off of the baby and the dog. 17 ticks off of the dog to be specific. I keep detailed journals. The lake? It really was only a quarter mile off the road, but it was also only a few hundred feet from the other road, the one on TOP of the ridge. We’ve been back several times since, always via the upper road. It’s an old logging spur and there’s a small spot where you can pull off and pitch a tent. A nice fire ring backs against the berm and if you walk a hundred feet to the north, you come out on a ridge with a view. I almost died there. That was the year we renamed the place “Mossy Rock” because we explored more to the east and discovered the more fascinating aspects to the topography: ancient old granite boulders so covered in moss that they form a soft bed, a hollow of old growth timber with dead falls forming bridges over the gullies and rocks, and a myriad of cedar trees that have been scratched by some large predator. We imagined it was a cougar, but I suppose it could be a bear. In some places, the scratches are ten feet up the base of the trees. We uncovered the complete skeleton of a four point white tail buck (we have the skull in our possession but left the rest of the skeleton where it lay). On our last day there, I meandered down to the view point to have my cup of coffee and enjoy the last smoky view of the upper Colowash River and North Fork Clackamas River basins. Our little weekend jaunt happened to coincide with opening weekend of deer season, but we hadn’t seen any hunters. Heard a few echoing rifle reports, but nothing to get excited about. Don was walking out of the trees when something sounding very like a missile came rocketing down the ridge, whistling in its mad descent, and passing just over my head. Had I been standing, it would have knocked me off of my perch. There’s an early scene in “Dances With Wolves” where Kevin Costner is hunkered down under a split rail fence and bullets come whizzing over his head. I jump every time I hear that sound. It wasn’t my time to die. I lived. I relate all of that to get to the point: we returned to Mossy Rock this past weekend. It’s been three years since my brush with fate. 23 years since we first ascended that miserable granite maze of ridges and angry rhododendrons. We’ve hiked into the fishing lake several times and dropped lines in the water. Once, we hiked back into the second lake (what a miserable hike that was)! We’ve taken three dogs into this country: Rosie the mutt, Sadie the Pointer, and Murphy. This is a great place for a picnic: soft as a down mattress, yet it’s all granite underneath that moss! This was a short hike on Friday, just in and around camp. Later, we stumbled down to The Lake, only to find the level had dropped significantly. I didn’t have my camera with me: we were just checking out the trail from camp into the lake and found the trail obliterated by downfall. The rhododendrons tried to wrap their long arms around my feet again, and pulled my hair, slapped my face and constantly tripped me. They’re worse than poltergeists. The boys atop the last ridge before the upper lake. The hike was a s miserable as I remember it, but this fifty-plus year old body held up to the climb. Mostly, that is. I was huffing, puffing and crying by this point. Then I remembered I am always huffing and puffing and crying by this point and that made me feel better. I mean, if I am now 50 years old and still able to get to this point, that’s a heck of an accomplishment! Of course, there’s no rhododendrons to try and trip me up. Only old dead trees and wind blown logs. This is some of the stuff we climbed to get where we wanted to be. You can either walk the logs or go up and down the draws. My balance isn’t what it used to be and the hiking boots I was wearing were not trustworthy on slippery objects: I climbed up and down instead of over. Murphy ran back and forth over. The upper lake was not much more than a mud hole this year. Murphy still sank out of sight. 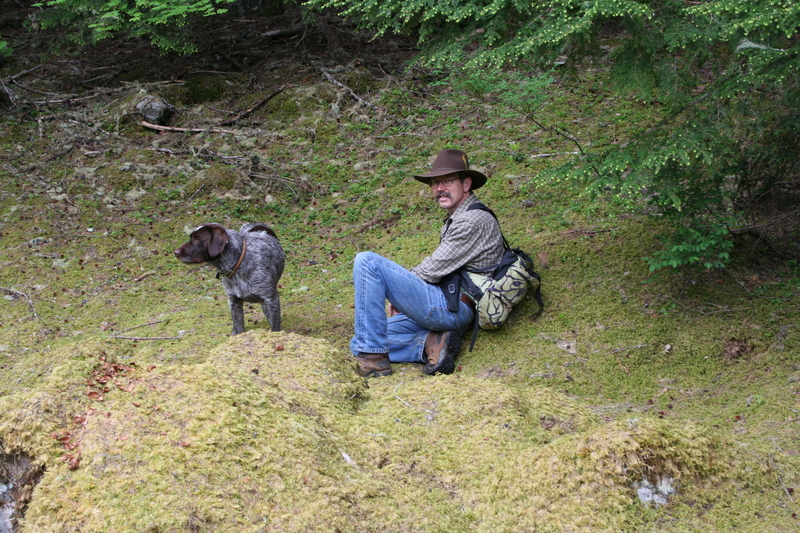 Don and I rested here before heading back to The Lake and the circle of rhododendrons protecting it. Ta da! We sidehilled back toward camp and dropped down low enough to come back out at the earthen dam end of The Lake. It’s much lower than in previous years – more of a pond now than a lake! We did see one lonely trout in the bottom. Murphy is the first dog we’ve owned that loves to swim. He jumped out into this log dam and then climbed back up on the rolling logs. 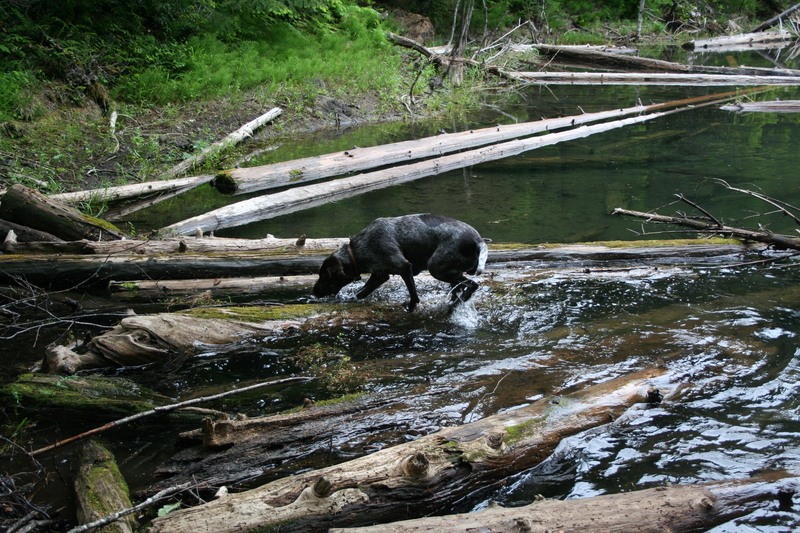 He was having a blast in the water and not doing half-bad at playing like a logger. This is a killer Pacific rhododendron in bloom.It is deceptively pretty. But just try to walk against those long branches! Bwahahahaha! Tomorrow: How hard it is to find a good campsite and Wednesday: all the pretty flowers!